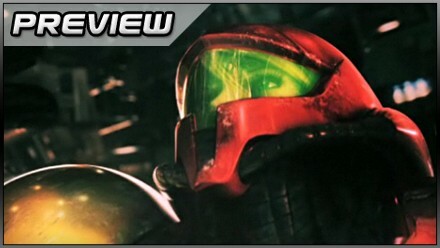 Samus gets all maternal in the most unconventional Metroid to date. Lengthy CGI cutscenes? A broody, brooding protagonist? Surly space marine ex-boyfriends? This certainly isn’t your father’s Metroid. Not that any of this should be a surprise from a developer like Team Ninja, the somewhat unlikely current custodians of Samus Aran. Yet an hour or so with Other M suggests the franchise is in safe and capable hands. It starts with a CGI action replay of Super Metroid’s denouement – Samus defeating a quite frightening re-imagined Mother Brain thanks to the intervention of a larval Metroid. As she opens her eyes and sees the friendly face of a quarantine officer, it becomes clear her vision was a dream, our heroine reliving her harrowing experience. Curiously, she seems more than a little perturbed at the demise of the Metroid she refers to as ‘the baby’. Aside from owing a debt to her improbable saviour, it seems there’s a deeper connection between Samus and the Metroid, the repetition of the word ‘baby’ in her inner monologue likely to become more significant as the game progresses. It’s certainly clear that Other M’s obvious anagram isn’t accidental. Power Rangers meets Blue Man Group. After a lingering shot of Aran’s curves in her skintight Zero Suit – classic Team Ninja – she steps into that familiar armour to test out her powers. 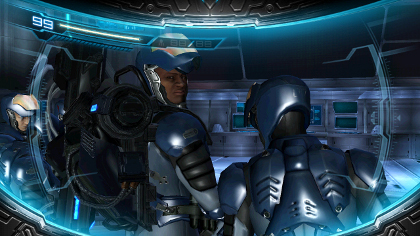 In a sterile grey chamber, the player is introduced to the new Samus Aran. Those expecting either a return to the series’ 2D roots or a kind of Metroid Gaiden in the style of the developer’s most famous work may be surprised at just how Other M works. With the remote held sideways, players guide Samus around 3D environments with the d-pad. Digital movement in three dimensions? It sounds like madness, but this unusual idea works, partly thanks to the responsiveness of the controls. Holographic enemies are sent in for Samus to blast, with a helpful auto-aim ensuring that shots fired roughly in the right direction will hit their target, while dodges are executed with a jab of the d-pad just before enemies or their projectiles hit. Posted in Previews, Spotlight, and tagged with nintendo, platformer, platforming, Team Ninja, Tecmo, wii.